The Irish soldier has never been a stranger to fighting the enemy with the odds stacked against him. The notion of charging into adversity has been a cherished part of Ireland's military history. In September 1961, another chapter should have been written into the annals, but it is a tale that lay shrouded in dust for years. The men of A Company, Thirty-Fifth Irish Infantry Battalion, arrived in the Congo as a United Nations contingent to help keep the peace. For many it would be their first trip outside their native shores. Some of the troops were teenage boys, their army-issue hobnailed boots still unbroken. They had never heard a shot fired in anger. Others were experienced professional soldiers but were still not prepared for the action that was to take place. 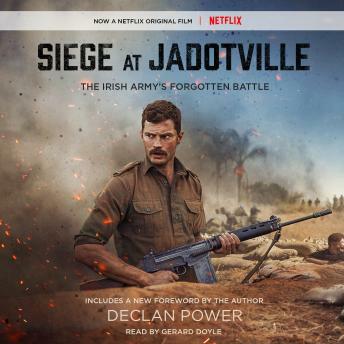 Led by Commandant Pat Quinlan, A Company found themselves tasked with protecting the European population at Jadotville, a small mining town in the southern Congolese province of Katanga. It fell to A Company to protect those who would later turn against them. On September 13th, 1961, the bright morning air of Jadotville was shattered by the sound of automatic gunfire. The men of A Company found their morning mass parade interrupted, and within minutes they went from holding rosaries to rifles as they entered the world of combat. This was to be no Srebrenica; though cut off and surrounded, the men of Jadotville held their ground and fought.